SSGHS is now accepting your computer inkjet and laser toner cartridges for most printers, copiers and fax machines. The cartridges will either be sold or exchanged for copier paper for the library. The result will be additional income for the Society and a reduction of waste going into the landfill. Laser/toner models must have Original Equipment Manufacturer labels (OEM) and cannot show signs of having been previously refilled. WE DO NOT ACCEPT ANY RE-MANUFACTURED LASER/TONER MODELS. 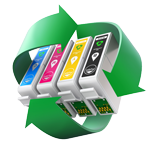 The inkjet models can be either OEM, or re-manufactured with the following stipulation: Re-manufactured INKJET models that have a branded label, such as but not limited to Office Depot or Planet Green are acceptable. Please ask you friends to donate their cartridges. Ask your employer if you may have the old equipment. Ask places where you do business to help. We are requesting that you mail or deliver these cartridges to our Library in Hazel Crest. This is a simple but important way for you to help raise money for SSGHS even if you live far away.